The Data adaptor is a mechanism through which the DataManager interact with the remote service or local dataSource. The DataManager has several preconfigured Data Adaptors, refer to the link. 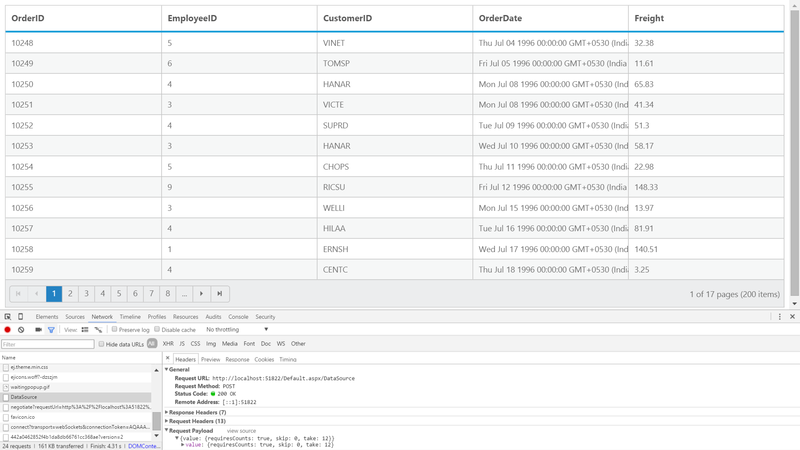 In Grid, the adaptor can be specified using the Adaptor property of the DataManager. The JSON Adaptor is used when the grid is bound with local datasource. It can be enabled in Grid using Adaptor property as ` JsonAdaptor. 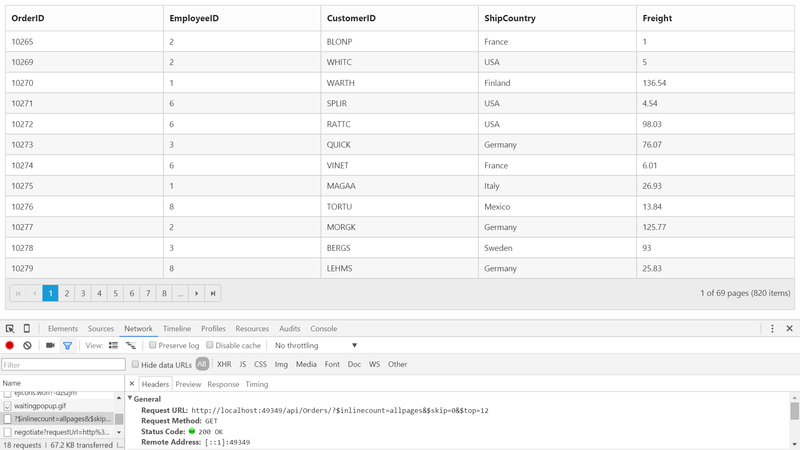 The JsonAdaptor is the default adaptor used by DataManager` when bind with datasource controls such as SqlDataSource, ObjectDataSource and also while using datasource such as IEnumerable, DataTable etc. The WebMethod Adaptor is used to bind data source from remote services and code behind methods. It can be enabled in Grid using Adaptor property of DataManager as WebMethodAdaptor. When using WebMethodAdaptor, grid actions such as Paging, Filtering and Sorting should be handled at the server side itself. We have DataOperation class to handle the server side operations. Refer to the kb link. These operations can also be done using the QueryableDataOperations class which accepts the IQueryable Data. Please refer the Kb link. • The response from server should be wrapped in object with properties named result to hold the data and count to hold the total records count. • The count must be returned along with response when paging is enabled in Grid. You can use the following code example to use WebMethod adaptor. The Url Adaptor is the base adaptor that would interact with remote services. It can be enabled in Grid using Adaptor property of DataSource as UrlAdaptor. For every operations, an AJAX post will be send to the specified data service. 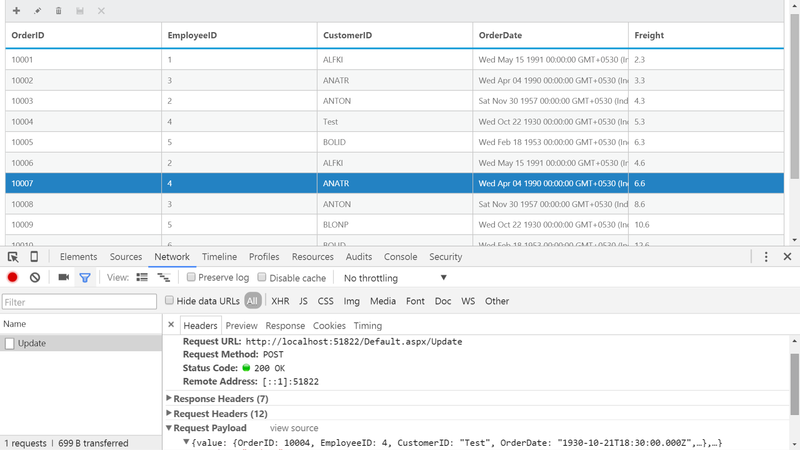 When using UrlAdaptor, grid actions such as Paging, Filtering and Sorting should be handled at the server side itself. We have DataOperation class to do these server side operations. Please refer to the kb link. These operations can also be done using the QueryableDataOperations class which accepts the IQueryable Data. Please refer the Kb link. The response from server should be wrapped in an object with properties named result to hold the data and count to hold the total records count. The count must be returned along with response when paging is enabled in Grid. OData Adaptor that is extended from UrlAdaptor, is used for consuming data through OData Service. You can use the following code example to use OData adaptor. You can use the following code example to use ODataV4 adaptor. To consume Web API service, set the service link to the Url property and set the adaptor type as ` WebApiAdaptor to the Adaptor Property of Grid DataManager`. You can use the following code example to use WebAPI adaptor. Sometimes you may need to perform all Grid Actions in client-side except the CRUD operations that should be interacted with server-side to persist data. It can be achieved in Grid by using RemoteSaveAdaptor. Datasource must be set to Json Property and set adaptor type as remoteSaveAdaptor to the Adaptor Property of Grid DataManager. CRUD operations can be mapped to server-side using UpdateUrl, InsertUrl, RemoveUrl, BatchUrl, CrudUrl properties. You can use the following code example to use RemoteSave adaptor. 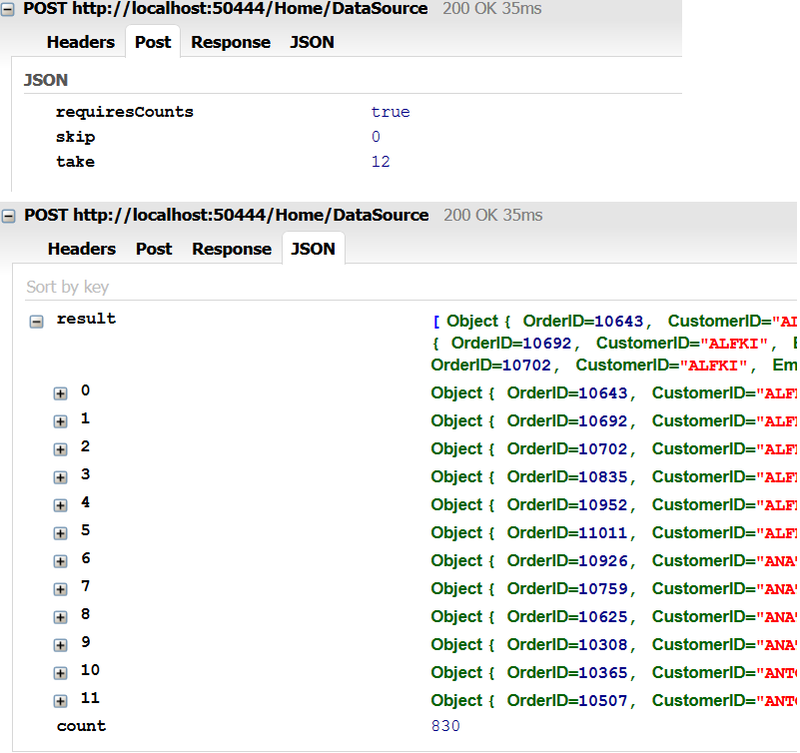 On performing CRUD operations in Grid, the record changes will be sent to server-side as in the following screenshot. The Grid can have a look up column. The Foreign key column using ForeignKeyField has some limitations such as sort/group operations on column will happen based on Field instead of ForeignKeyField. The ForeignKeyAdaptor can be used to overcome this limitation. 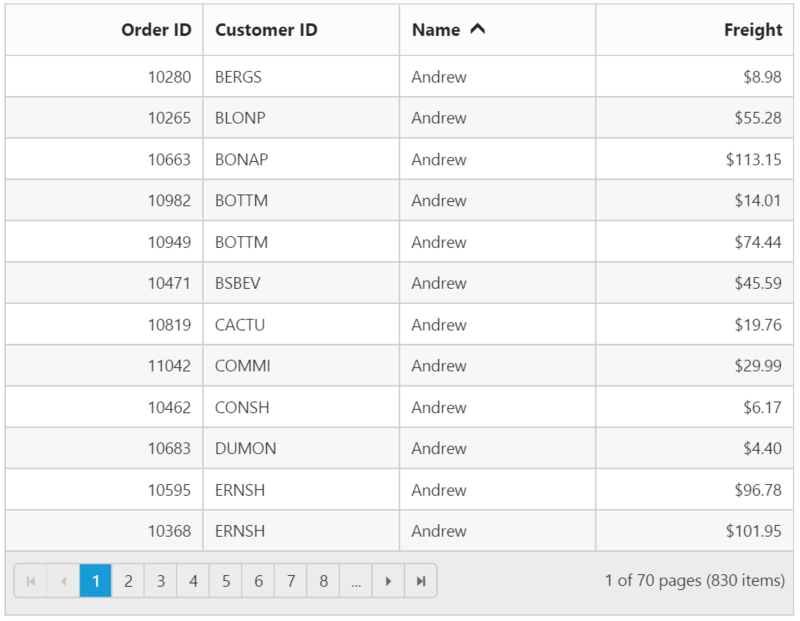 It works by specifying a virtual column (which is not in the grid datasource) in the Grid. This adaptor should be initialized in the Load event of the grid. ForeignKeyAdaptor supported for only local data binding. 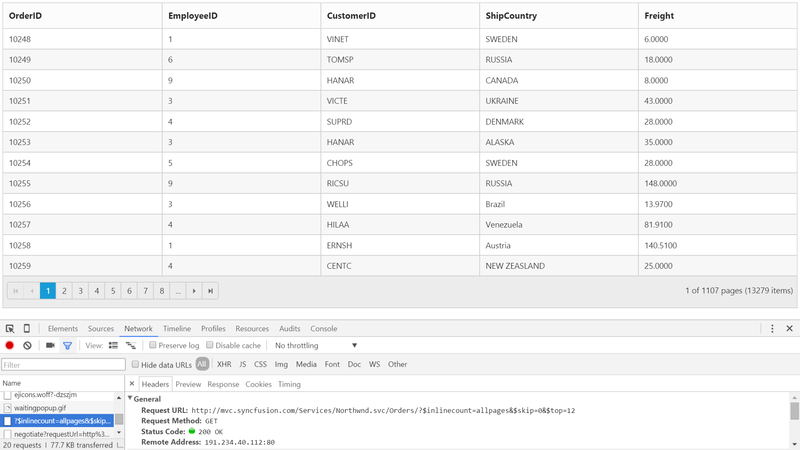 The Field name of the virtual column should be the name of the field to display from foreign datasource, in the above code example, FirstName column is the virtual column. By default, the ForeignKeyAdaptor uses JsonAdaptor, to use other adaptors specify the adaptor name as the second argument during initialization.